Ellen Gould Harmon was born in 1827 to Methodist parents at Gorham, Maine, USA. At age 9, she suffered a near-fatal accident, terminating her formal education, making her a sickly child. In 1840, intrigued by Baptist preacher William Miller's "Advent awakening" revival preaching, Ellen gave her heart to Jesus. Soon after, baptism and membership in the Methodist church. She was deeply disappointed when Jesus did not return in 1843 and again in October 1844 as predicted by Millerites. At age 17 (December 1844), she experienced her first of many visions. Married evangelist James White in 1846. Ellen White published her first of dozens of books, A Sketch of the Christian Experience and Views of Ellen G. White in 1851. In 1888 she published her most famous book, The Great Controversy Between Christ and Satan; and in 1898 she published The Desire of Ages, a classic biography on the life and teachings of Jesus Christ. In vision Mrs. White was shown various future events. For example, she was shown the devastating 1906 San Francisco earthquake 2 days before it took place. Mrs. White continued to write and minister until she fell and broke her hip at the age of 86. She died five months later, July 16, 1915, and was buried in Battle Creek, Michigan. Bracket Street School where Ellen White attended. Location of Miller's lectures in Portland. The Methodist Church Ellen White attended. Earliest photograph of the Whites. Publisher's Note: The "Life Sketch" section presents excerpts excerpts from biographies of Ellen White and from narratives of Ellen White's own story as published in her autobiographical writings. These are posted on the EllenWhite.info website without comment. 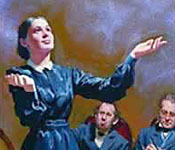 The opinions of Ellen White's critics are examined in the Criticisms & Critics section of the website.